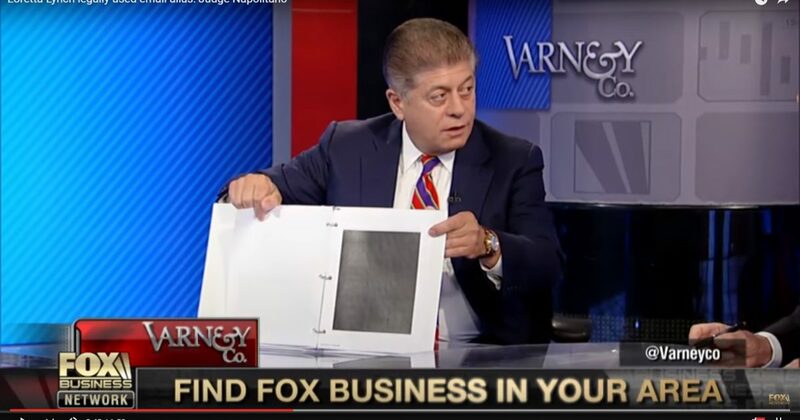 Fox News legal expert Judge Napolitano is typically a very level-headed, calm, serious commentator. But that wasn’t the case when he took a look at the Loretta Lynch emails relating to her meeting with Slick Willie on the airport tarmac in Phoenix, a meeting I’m sure Slick and Lynch thought was secret, and would have been had it not been for a snooping Phoenix news reporter who discovered that it was Lynch and Clinton who were meeting on that plane. Napolitano described himself as “infuriated,” a word I had never heard him use to describe himself. He isn’t infuriated at Lynch using an alias for official communications, something he claims is not illegal or even unethical. He is not even infuriated that all 350 pages of the emails relating to the meeting are redacted, completely black, obviously hiding something. What the judge is infuriated over is who did the redacting…. Attorney General Jeff Sessions, who, for unknown reasons, is protecting Lynch. This should be the last straw. Sessions is either a total wimp or there is some sort of establishment-style quid pro quo at work here. In either case, President Trump should remove Sessions immediately and replace him with a trustworthy Pit Bull like Trey Gowdy. Come to think of it, Gowdy is a Pit Bull sure enough, but I’m not 100% convinced that he is trustworthy.